This 13.3-Inch HP Business Chromebook 13 G1 model represents the entry-level device in the new Hewlett-Packard line of upscale business-style Chromebook computers. As is the case with the entire Chromebook line, it is characterized by simplicity, speed of setup, smooth maintenance and collaboration, and exceptional security, all of which have contributed to the tremendous popularity of these devices. 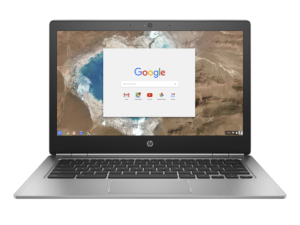 This specific 13.3-Inch HP Chromebook 13 G1 model features an elegant brushed anodized aluminum upper section, decidedly thin and light construction, a bright, crisp, and vibrant 3200x1800p Quad-HD Plus non-touch IPS display, an excellent keyboard and trackpad, superb connectivity that includes two exceedingly versatile USB Type-C ports, 4GB of system memory, and 32GB of onboard eMMC flash storage. A nice Chromebook with a couple of caveats. The screen has native resolution of 3200 x 1800, but it isn’t useable under Chrome OS with this resolution: you have to set it to 1600 x 900 to get menus and tab labels in a font big enough to be readable, since ChromeOS (still!) doesn’t scale its UI text for the pixel size. Nevertheless the screen looks very good even at the lower-than-native resolution. It is powered by the sixth-generation 1.5GHz Intel Pentium-4405Y dual-core processor, with the integrated Intel HD Graphics 515 Chipset. This Intel Pentium-4405Y processor is an ultra-low-voltage mobile processor, based on the sixth-generation Intel Skylake microarchitecture, which delivers solid performance, low power consumption, long battery life and run time, low heat generation, and a fanless and silent system. It provides more than sufficient capability for mainstream day-to-day computing activities, as well as higher levels of multitasking, along with fluid and smooth scrolling and navigation on content-rich and graphics-heavy websites. Battery life is approximately eight hours, depending on the type of usage, and will usually cover an entire work day.